Wonderland by the sea – On our Winter Getaway! On this winter getaway, planning your Ogunquit trip is easy. When you arrive together, settle into our hotel to relax and unwind. Then take a dip in the Roman Spa with swirling salt waters. Head into town for dinner or ask us for a recommendation to a nearby restaurant. The next day, explore Ogunquit village, Marginal Way and more before returning to relax in the steam and sauna. All options for our hotel on our Winter Wonderland Getaway are sure to provide a quiet escape. After all, our cozy atmosphere and warm welcome have made us a favorite for over 30 years. 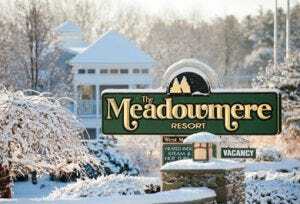 Guests rave about the value of the accommodations, enjoying Maine’s seafood and returning year after year to The Meadowmere Resort’s luxurious amenities in the heart of Ogunquit. With indoor pool, award winning health club and evening shows in our TV Room, your winter getaway to Ogunquit is just like a trip to Wonderland. Special applies to new reservations on the night of lesser value. Restrictions apply. Excludes taxes. Cannot combine with other offers. Not valid on Friday/Saturday nights.